What is a good step by step explanation on how to use the Boost library in an empty project in Visual Studio? While Nate's answer is pretty good already, I'm going to expand on it more specifically for Visual Studio 2010 as requested, and include information on compiling in the various optional components which requires external libraries. If you are using headers only libraries, then all you need to do is to unarchive the boost download and set up the environment variables. The instruction below set the environment variables for Visual Studio only, and not across the system as a whole. Note you only have to do it once. Unarchive the latest version of boost (1.47.0 as of writing) into a directory of your choice (e.g. C:\boost_1_47_0). Create a new empty project in Visual Studio. Open the Property Manager and expand one of the configuration for the platform of your choice. Select & right click Microsoft.Cpp.<Platform>.user, and select Properties to open the Property Page for edit. Select VC++ Directories on the left. 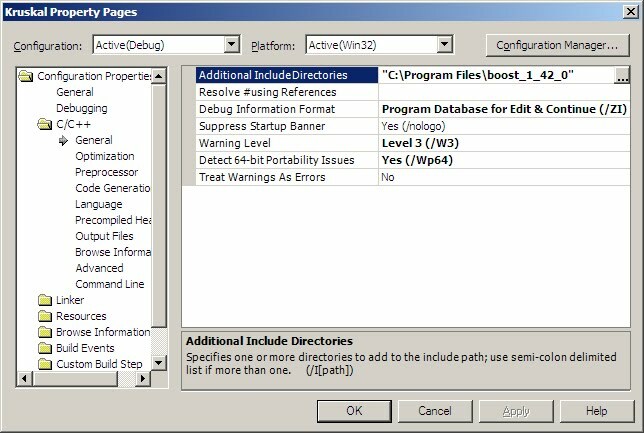 Edit the Include Directories section to include the path to your boost source files. Repeat steps 3 - 6 for different platform of your choice if needed. If you want to use the part of boost that require building, but none of the features that requires external dependencies, then building it is fairly simple. Start the Visual Studio Command Prompt for the platform of your choice and navigate to where boost is. Run: bootstrap.bat to build b2.exe (previously named bjam). Go through steps 2 - 6 from the set of instruction above to set the environment variables. Edit the Library Directories section to include the path to your boost libraries output. (The default for the example and instructions above would be C:\boost_1_47_0\stage\lib. Rename and move the directory first if you want to have x86 & x64 side by side (such as to <BOOST_PATH>\lib\x86 & <BOOST_PATH>\lib\x64). Repeat steps 2 - 6 for different platform of your choice if needed. Unarchive the latest version of bzip2 library (1.0.6 as of writing) source files into a directory of your choice (e.g. C:\bzip2-1.0.6). Follow the second set of instructions above to build boost, but add in the option -sBZIP2_SOURCE="C:\bzip2-1.0.6" when running b2 in step 5. Unarchive the latest version of zlib library (1.2.5 as of writing) source files into a directory of your choice (e.g. C:\zlib-1.2.5). Follow the second set of instructions above to build boost, but add in the option -sZLIB_SOURCE="C:\zlib-1.2.5" when running b2 in step 5. Install a MPI distribution such as Microsoft Compute Cluster Pack. Follow steps 1 - 3 from the second set of instructions above to build boost. Edit the file project-config.jam in the directory <BOOST_PATH> that resulted from running bootstrap. Add in a line that read using mpi ; (note the space before the ';'). Follow the rest of the steps from the second set of instructions above to build boost. If auto-detection of the MPI installation fail, then you'll need to look for and modify the appropriate build file to look for MPI in the right place. Install a Python distribution such as ActiveState's ActivePython. Make sure the Python installation is in your PATH. To completely built the 32-bits version of the library requires 32-bits Python, and similarly for the 64-bits version. If you have multiple versions installed for such reason, you'll need to tell b2 where to find specific version and when to use which one. One way to do that would be to edit the file project-config.jam in the directory <BOOST_PATH> that resulted from running bootstrap. Add in the following two lines adjusting as appropriate for your Python installation paths & versions (note the space before the ';'). Do note that such explicit Python specification currently cause MPI build to fail. So you'll need to do some separate building with and without specification to build everything if you're building MPI as well. Follow the second set of instructions above to build boost. Unarchive the latest version of ICU4C library (4.8 as of writing) source file into a directory of your choice (e.g. C:\icu4c-4_8). 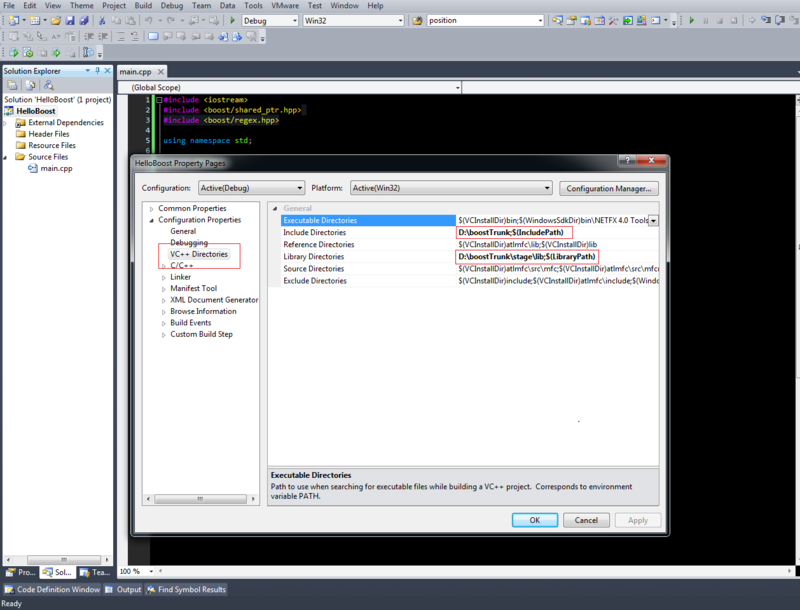 Open the Visual Studio Solution in <ICU_PATH>\source\allinone. Build All for both debug & release configuration for the platform of your choice. There can be a problem building recent releases of ICU4C with Visual Studio 2010 when the output for both debug & release build are in the same directory (which is the default behaviour). A possible workaround is to do a Build All (of debug build say) and then do a Rebuild all in the 2nd configuration (e.g. release build). If building for x64, you'll need to be running x64 OS as there's post build steps that involves running some of the 64-bits application that it's building. Optionally remove the source directory when you're done. Follow the second set of instructions above to build boost, but add in the option -sICU_PATH="C:\icu4c-4_8" when running b2 in step 5. While the instructions on the Boost web site are helpful, here is a condensed version that also builds x64 libraries. You only need to do this if you are using one of the libraries mentioned in section 3 of the instructions page. (E.g., to use Boost.Filesystem requires compilation.) If you are not using any of those, just unzip and go. This installs the Boost header files under C:\Boost\include\boost-(version), and the 32-bit libraries under C:\Boost\lib\i386. Note that the default location for the libraries is C:\Boost\lib but you’ll want to put them under an i386 directory if you plan to build for multiple architectures. Unzip Boost into a new directory. Start a 32-bit MSVC command prompt and change to the directory where Boost was unzipped. Add C:\Boost\include\boost-(version) to your include path. Add C:\Boost\lib\i386 to your libs path. This installs the Boost header files under C:\Boost\include\boost-(version), and the 64-bit libraries under C:\Boost\lib\x64. Note that the default location for the libraries is C:\Boost\lib but you’ll want to put them under an x64 directory if you plan to build for multiple architectures. Start a 64-bit MSVC command prompt and change to the directory where Boost was unzipped. Add C:\Boost\lib\x64 to your libs path. You can also try -j%NUMBER_OF_PROCESSORS% as an argument it will use all your cores. Makes things super fast on my quad core. Right click on your project node, and select 'Add new project property sheet'. Modify the additional Include and Lib folders to the search path. Right click on the project node, and select 'Add existing property sheet'. Select the boost property sheet. It contains a user macro for the location of the boost directory (in this case, D:\boost_1_53_0) and two other parameters: IncludePath and LibraryPath. A statement #include <boost/thread.hpp> would find thread.hpp in the appropriate directory (in this case, D:\boost_1_53_0\boost\thread.hpp). The 'stage\lib\' directory may change depending on the directory installed to. This boost.props file could be located in the D:\boost_1_53_0\ directory. This thread has been around a while, and I thought I'd add something about HOW to build Boost as fast as possible on your specific hardware. If you have a 4 or 6-core use -j5 or -j7 respectively. Certainly not the standard build nor -j2 unless you indeed have dual core. I'm running a Sandy Bridge Extreme with stock clocked 3930K (6-core) on my main station, but have a 2600k (4-core) on older backup box, and the trend is I get the best Boost compile times with N + 1 build processes where N is the number of physical cores. N+2 reaches a point of diminishing returns and the times go up. 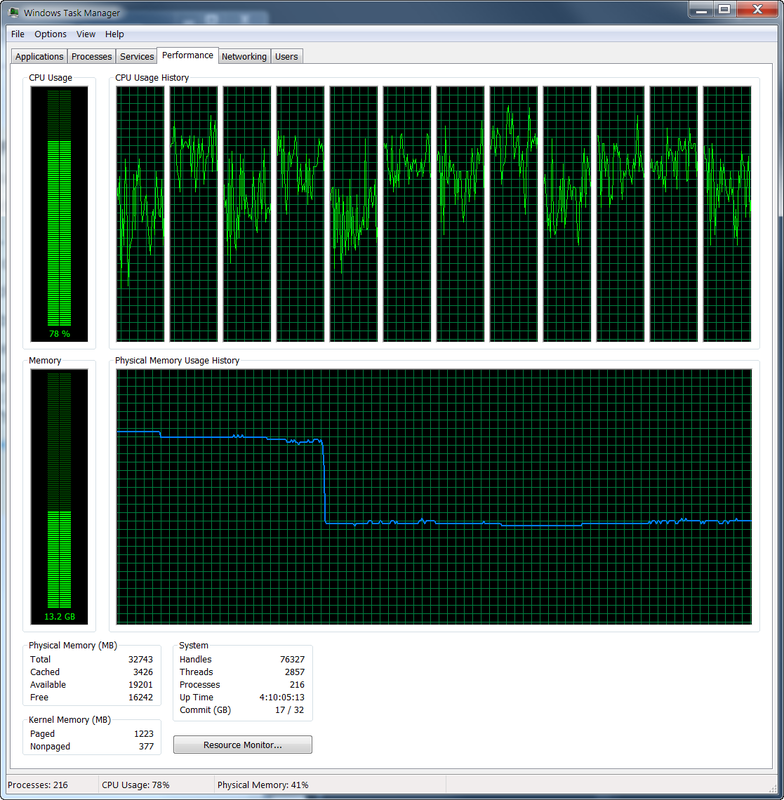 Notes: Hyperthreading is enabled, 32GB RAM DDR3, Samsung 840 EVO SSD. Building the Boost C++ Libraries. I note the 64-bit build takes a bit longer, I need to do the same comparison for those and update. Download and extract the zip version of Boost libraries. Run bootstrap.bat file and then run bjam.exe. Wait for roughly 30 minutes or so. Go to project-->properties-->Linker-->General-->Additional Library Directories and add boost/stage/lib directory to it. Go to project-->properties-->C/C++-->General-->Additional Include Directories and add boost directory to it. You will be able to build your project without any errors ! Paste this code and check if it is working? Follow the installation wizard until finished. Under "C/C++ > General > Additional Include Directories" add the path where boost root directory. Default for my version was C:\local\boost_1_63_0. The number after "boost" is the version of boost. In project properties, under "Linker > Additional Library Directories" add the directory for library files. Default for my version was C:\local\boost_1_63_0\lib64-msvc-14.0. The number after "lib" is related to the build target (32 bit or 64 bit in Visual Studio) and the number after "msvc" is related to the version of Visual Studio (14.0 is related to Visual Studio 2015, but I'm using it with the 2017 Visual Studio). If you are using the free Visual Studio c++ 2010 Express, and managed to get that one to compile 64-bits binaries, and now want to use that to use a 64-bits version of the Boost libaries, you may end up with 32-bits libraries (your mileage may vary of course, but on my machine this is the sad case). 1.Download and unzip Boost from here. In addition, there is something I find very useful. Use environment variables for your boost paths. (How to set environment variables in windows, link at bottom for 7,8,10) The BOOST_ROOT variable seems to be common place anymore and is set to the root path where you unzip boost. Then in Properties, c++, general, Additional Include Directories use $(BOOST_ROOT). Then if/when you move to a newer version of the boost library you can update your environment variable to point to this newer version. As more of your projects, use boost you will not have to update the 'Additional Include Directories' for all of them. You may also create a BOOST_LIB variable and point it to where the libs are staged. So likewise for the Linker->Additional Library Directories, you won't have to update projects. I have some old stuff built with vs10 and new stuff with vs14 so built both flavors of the boost lib to the same folder. So if I move a project from vs10 to vs14 I don't have to change the boost paths. NOTE: If you change an environment variable it will not suddenly work in an open VS project. VS loads variables on startup. So you will have to close VS and reopen it. Not the answer you're looking for? Browse other questions tagged c++ visual-studio-2010 boost or ask your own question. failed updating 58 targets when trying to build boost, what happened?